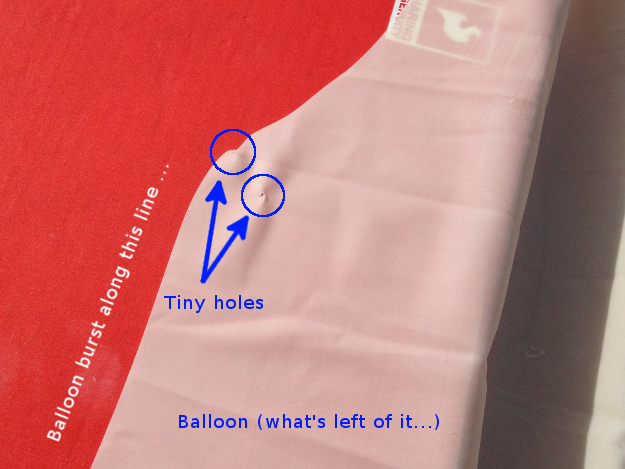 Postmortem inspection of the balloon (or what was left of it) turned up two tiny holes in its surface. Similar hole was also in the plastic bag the balloon was shipped in. It looks like at some point, the balloon package got pinched. While filling the balloon, the holes started expanding and caused the surface to rip along one of the holes. We also found that inflator’s nozzle might have frozen due to rapid expansion of the gas.